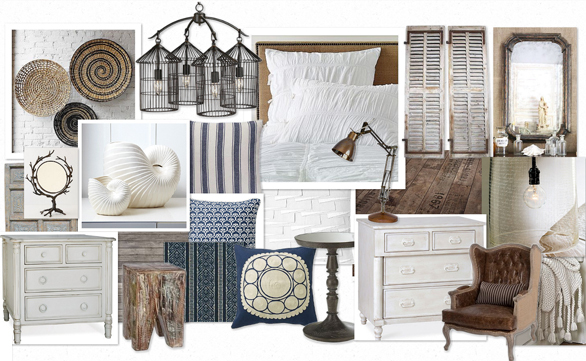 Day seven and the design of the day is… a romantic coastal bedroom. The idea for this space is for people to see the colours of the beach when they step into the room. The earthy browns and tans pull from the colour of sand on the beach while the deep blue brings the ocean indoors. It is meant to feel like the perfect, relaxing and romantic getaway. What I really enjoy is the contrast of the crisp white bedding against the more rustic pieces and the various textures that give the room some depth. You probably recognize the decorative bowl wall art from the last post. They fit perfectly into this design so I decided to reuse them. How would you decorate your perfect getaway?